There are currently more young people in the world than ever, 1.8 billion, the largest generation in history. Of the 258 million international migrants, around 11 percent of them were below 24 years old in 2017. Young people have a key role in policy discussions, rising up worldwide for their rights and better opportunities and demanding a seat at the table in decision-making processes. Against this background, the International Dialogue for Migration 2019 will be dedicated to discussing how to engage youth as a key partner in global processes on migration. The 2019 IDM responds to the calls for greater engagement with youth made by participants at IDM and it is aligned with the United Nations Youth Strategy which recognizes the potential of the youth to advance progress in many policy areas, considering young people’s first-hand experience. The first of two IDM sessions planned in 2019 took place on 28 February at UN Headquarters and discussed global strategies and partnerships in the area of youth mobility as well as best practices for youth engagement in policy and decision-making processes. 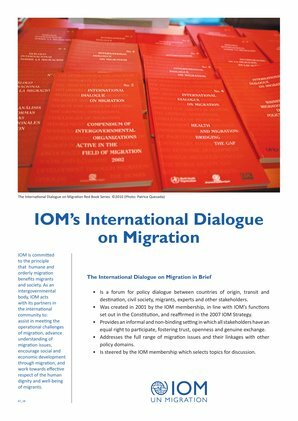 Adaptation, integration, and empowerment of young migrants were also among the topics explored through an exchange of good practices, lessons learned and recommendations, involving youth representatives, young migrants, governments, academia, civil society and international organizations. 11:30-13:00 Session 2: Addressing specific challenges and vulnerabilities of young people: what role, which partners?